» home » magazine » 2009 » january 2009 » metal-to-metal adhesive bonds within 16 min. Devcon, Danvers, MA, has introduced Metal Welder II, a two-part, 10:1 methacrylate adhesive formulated for structural bonding of metal alloys to other alloys or to dissimilar substrates such as thermoplastics or composites. With a working time of 14 to 16 min., it is ideal for assembly of signs, appliances, furniture, consumer electronics and other OEM products. Mixed as dispensed from hand-held manual or pneumatic dispensers with static mixing nozzles, it attains functional cure in 2 to 4 hr. at room temperature. 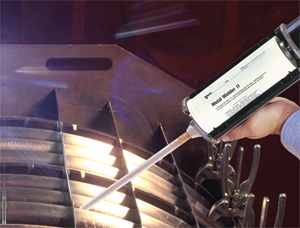 Metal Welder II requires no primers and produces permanent, load-bearing bonds that withstand service temperatures from -40 to 250 F and resist glycols, motor oil, mineral spirits and gasoline. The gel, with low-odor and low-VOC emissions, cures to a tensile shear strength of 2520 psi. Tensile elongation is 50 to 75 percent; impact resistance is 20 ft.-lb./in.2. Metal Welder II can be used in place of mechanical fasteners, and is particularly useful for bonding thin metal panels in applications where welding would produce aesthetically unacceptable dimpling or scorching. Because it distributes stresses over the entire length of the bond line instead of concentrating them at rivets or screws, the adhesive reportedly produces stronger bonds and prevents the loosening and leaking that can occur when fastener holes expand due to vibration or flexing.